This article is about the 2010-present Lego theme. For the Lego toy people themselves, see Lego minifigure. Various, such as from sports, history, popular culture, etc. Lego has eliminated the figurine-specific bar codes on all Series 3 and 4 packages and replaced them with a braille-like system of dots embossed in the lower seal of the bag. In theory, this will allow customers to continue identifying the figure enclosed within. Later series do not have any markings to indicate their contents. On average a new series has been released every four months. Release dates sometimes vary between countries. 9 Magician Wand Comes with additional hair piece. 14 Forestman Bow and arrow Modeled after the 1980's-90's Forestmen subtheme, and by extension Robin Hood. 7 Explorer Binoculars, Magnifying glass Based on an explorer during the Scramble for Africa. 9 Mime Comes with 2 other heads for different expressions. 14 Karate Master Trophy This was the first time the trophy piece was introduced in LEGO. 12 Gorilla Suit Guy Banana A Minifigure in a gorilla suit. 7 The Monster Modeled after Frankenstein's monster. 6 Lizard Man A Minifigure in a lizard suit. 11 Detective Magnifying glass Modeled after Sherlock Holmes. 14 Egyptian Queen Snake Based on Cleopatra VII. 3 Bunny Suit Guy Carrot A Minifigure in a rabbit suit. 10 Jungle Boy Chimpanzee, Knife Modeled after Tarzan. 16 Grandma Visitor Basket Modeled after Little Red Riding Hood. 14 Thespian Skull Based on the Shakespearean tragedy Hamlet. 16 Alien Villainess Raygun Reference to LEGO’s Alien Conquest theme. 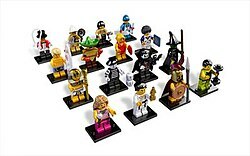 To commemorate the London Olympic games, an exclusive series of minifigures was released exclusively in the United Kingdom to mark the opening of the Olympics. 3 Hollywood Starlet Trophy Modeled after Marilyn Monroe. 5 Roman Emperor Letter Modeled after Julius Caesar. 14 Mr. Good and Evil Flask Modeled after Dr. Jekyll and Mr. Hyde. 15 Forest Maiden Longbow, Shield Modeled after Maid Marian. 7 Bumblebee Girl Honeypot A Minifigure in a bumblebee suit. Mr. Gold Staff Limited edition (5000 produced). 2 Scarecrow Pitchfork Comes with a crow that attaches to hat. 16 Lady Robot Female version of the Clockwork Robot (Series 6). 7 Bad Cop/Good Cop Handcuffs, Smartphone Scribble-Face version. 15 Panda Guy Teddy bear A Minifigure in a panda suit. 5 Maggie Simpson Teddy bear Teddy is Bobo the Bear. 16 Mr. Burns Fishbowl, Radioactive material Blinky the Three-Eyed Fish is printed on fishbowl. 1 Wizard Wand Modeled after Merlin. 14 Piggy Guy Apple A Minifigure in a pig suit. 15 Genie Girl Magic lamp Modeled after Jeannie from I Dream of Jeannie. Series 13 (set number: 71008) was released in the UK in early December 2014 and the US around Christmas 2014. 3 Unicorn Girl A Minifigure in a unicorn suit. 10 Evil Wizard Scepter Modeled after Ming the Merciless. 14 Hot Dog Guy A Minifigure dressed as a hot dog. 15 Lady Cyclops Club Female version of the Cyclops (Series 9). The LEGO Simpsons Series 2 (set number: 71009) was released in the UK & the US in April 2015 and includes characters from The Simpsons and is a continuation to the LEGO Simpsons series 1. 1 Wolf Guy Bone Shapeshifted version of the Lumberjack (series 5). 9 Tiger Woman Whip A Minifigure in what appears to be a tiger suit, although her bio suggests it is actually her skin. 11 Skeleton Guy Jack-o'-lantern bucket A Minifigure in a Halloween skeleton costume. 12 Monster Rocker Electric guitar A rock music version of Frankenstein's monster. 5 Tribal Woman Baby wrapped in cloth Modeled after Sacagawea. 13 Shark Suit Guy A Minifigure in a shark suit. 14 Wrestling Champion Trophy Modeled after The Ultimate Warrior. 1 Joachim Löw Coaching board Team manager. 2 Manuel Neuer Football Shirt #1. 3 Jérôme Boateng Football Shirt #17. 4 Mats Hummels Football Shirt #5. 5 Benedikt Höwedes Football Shirt #4. 6 Shkodran Mustafi Football Shirt #2. 7 Bastian Schweinsteiger Football Shirt #7. 8 Mesut Özil Football Shirt #8. 9 Thomas Müller Football Shirt #13. 10 Toni Kroos Football Shirt #18. 11 Sami Khedira Football Shirt #6. 12 André Schürrle Football Shirt #9. 13 Marco Reus Football Shirt #21. 14 Christoph Kramer Football Shirt #20. 15 Mario Götze Football Shirt #19. 16 Max Kruse Football Shirt #23. 4 Cute Little Devil Jack-o'-lantern bucket, Trident A Minifigure in a devil suit. 10 Penguin Boy A Minifigure in a penguin suit. 15 Banana Guy A Minifigure in a banana suit. 4 Corn Cob Guy A Minifigure dressed as a corn cob. 7 Butterfly Girl Flowers A Minifigure with butterfly wings. 13 Rocket Boy Flag A Minifigure dressed as a rocket. 16 Highwayman Flintlock pistols (2) Identified as 'The Mystery Man'. 1 Kai Kendo Poles (2) Comes with additional hair piece. 3 Lloyd Blueprint, Sword Comes with additional hair piece. Green ninja version. 9 Misako Purse Also known as Koko. 1 Disco Harley Quinn Based on friends are family song. 2 Disco Alfred Pennyworth Electric guitar Based on friends are family song. 13 Wonder Twin Jayna Record disc, Record disc case Based on the Super Friends cartoon series. 14 Wonder Twin Zan Bucket of water Based on the Super Friends cartoon series. 15 Apache Chief Photo booth photographs Based on the Super Friends cartoon series. 20 Black Vulcan Lightning bolts (2) Based on the Super Friends cartoon series. 1 Elephant Girl Mouse A minifigure in an elephant suit. 6 Birthday Party Girl Present with biscuits (2), Purple balloon Party hat clips onto hair piece. 7 Dragon Suit Guy A Minifigure in a dragon suit. Commemorates dragon from Lego set 70403 "Dragon Mountain" (2013). 8 Classic Police officer Lego set box Commemorates Lego set 600 "Police Car" (1978). Only 1 per box of 60. 9 Spider Suit Boy Spider A Minifigure in a spider suit. 10 Birthday Cake Guy Birthday cake Party hat clips onto hair piece. 12 Cat Costume Girl Fish A Minifigure in a cat costume. 17 Unicorn Guy Sword, Shield Male version of the Unicorn Girl (Series 13). 14 Alastor 'Mad-Eye' Moody Wand, Staff, Vial Comes with alternate hairpiece to become Barty Crouch Jr.
22 Percival Graves Wand Comes with alternate hairpiece to become Gellert Grindelwald. 2 Battle-Ready Lucy Binoculars Apocalyptic version of Wyldstyle. 3 Swamp Creature Whip Apocalyptic version of the "Swamp Creature" from the Monster Fighters theme. 4 Crayon Girl Drawing A Minifigure in a crayon suit. 5 Giraffe Guy Foliage A Minifigure in a giraffe suit. 6 Watermelon Dude Watermelon slice A Minifigure in a watermelon suit. 7 Sherry Scratchen-Post & Scarfield Cat Apocalyptic version of Mrs. Scratchen-Post. 8 Apocalypse Benny Toolbox Apocalyptic version of Benny the Spaceman. 10 Dorothy Gale Dog (Toto) Modeled after Dorothy Gale from The Wizard of Oz. 11 Cowardly Lion Medal Modeled after the Cowardly Lion from The Wizard of Oz. 12 Tin Man Axe, Heart Modeled after the Tin Man from The Wizard of Oz. 13 Scarecrow Certificate Modeled after the Scarecrow from The Wizard of Oz. 18 Apocalypseburg Abe Battle axe Apocalyptic version of Abraham Lincoln. 19 Unikitty First character in the theme that's not a Minifigure. On August 29, 2013, Funcom officially announced a massively multiplayer online game based on the Minifigures theme, in which there are several worlds the player can travel to and fight enemies, as well as dungeons based on the setting. The game uses traditional click-to-move mechanics, allowing younger users to jump into the action. However, for advanced users, there are special abilities activated using the number pad. It is going to be free-to-play, but you can unlock Minifigures by purchasing one and entering a code, however they can also be obtained in-game. It was released in late 2014 for iOS, Android, and PC as either a download client or in-browser on the LEGO website. Funcom announced that LEGO Minifigures Online will be closing on September 30, 2016. Starting June 6, 2016, new players will be unable to join the game and the in-game chat will be disabled. Existing players will still be able to play up until September 30, 2016. ^ "LEGO Minifigures". Lego shop. Archived from the original on 2010-07-29. ^ "Barcodes of the Collectible Minifigures". bricks.inof.de. ^ "Mini Collector". 30 August 2010. ^ "Dot codes for US Series 3". fbtb.net. ^ "Dot codes sheet for LEGO Minifigures Series 5". 5 August 2011. ^ "Collectable Minifigures: Series 01". Brickset. Retrieved 18 March 2018. ^ "Collectable Minifigures: Series 02". Brickset. Retrieved 18 March 2018. ^ "Collectable Minifigures: Series 03". Brickset. Retrieved 18 March 2018. ^ "Collectable Minifigures: Series 04". Brickset. Retrieved 18 March 2018. ^ "Collectable Minifigures: Series 05". Brickset. Retrieved 18 March 2018. ^ "Collectable Minifigures: Series 06". Brickset. Retrieved 18 March 2018. ^ "Collectable Minifigures: Series 07". Brickset. Retrieved 18 March 2018. ^ "Collectable Minifigures: Series 08". Brickset. Retrieved 18 March 2018. ^ "Collectable Minifigures: Team GB". Brickset. Retrieved 18 March 2018. ^ "Collectable Minifigures: Series 09". Brickset. Retrieved 18 March 2018. ^ "Collectable Minifigures: Series 10". Brickset. Retrieved 18 March 2018. ^ "Collectable Minifigures: Series 11". Brickset. Retrieved 18 March 2018. ^ "Collectable Minifigures: The LEGO Movie". Brickset. Retrieved 18 March 2018. ^ "Collectable Minifigures: The Simpsons". Brickset. Retrieved 18 March 2018. ^ "Collectable Minifigures: Series 12". Brickset. Retrieved 18 March 2018. ^ "Collectable Minifigures: Series 13". Brickset. Retrieved 18 March 2018. ^ "Collectable Minifigures: The Simpsons Series 2". Brickset. Retrieved 18 March 2018. ^ "Collectable Minifigures: Series 14". Brickset. Retrieved 18 March 2018. ^ "Collectable Minifigures: Series 15". Brickset. Retrieved 18 March 2018. ^ "Collectable Minifigures: Disney". Brickset. Retrieved 18 March 2018. ^ "Collectable Minifigures: DFB Series". Brickset. Retrieved 18 March 2018. ^ "Collectable Minifigures: Series 16". Brickset. Retrieved 18 March 2018. ^ "Collectable Minifigures: The LEGO Batman Movie". Brickset. Retrieved 18 March 2018. ^ "Collectable Minifigures: Series 17". Brickset. Retrieved 18 March 2018. ^ "Collectable Minifigures: The LEGO NINJAGO Movie". Brickset. Retrieved 18 March 2018. ^ "Collectable Minifigures: The LEGO Batman Movie Series 2". Brickset. Retrieved 18 March 2018. ^ "Collectable Minifigures: Series 18". Brickset. Retrieved 18 March 2018. ^ "Collectable Minifigures: Wizarding World". Brickset. Retrieved 4 August 2018. ^ "The LEGO Movie 2: The Second Part". Brickset. Retrieved 1 February 2019. ^ "funcom.com - LEGO Minifigures Online". funcom.com. Retrieved 30 September 2014.